Enter your filing status, income, deductions and credits and we will estimate your total taxes. Based on your projected tax withholding for the year, we can also estimate your tax refund or amount you may owe the IRS next April. Please note this calculator is for the current 2019 tax year which is due in April of 2020. We also offer calculators for the recently passed 2018 & 2017 tax years. Get out your pencils and your tax forms and sit down to look them over and you are bound to become perplexed. The average person has to wonder who could have come up with this maze of information. It is all so confusing and time consuming. There is more than one reason after all why so many people hate to sit down and do their taxes. Actually paying the taxes is just part of what is so frustrating. What Information Is Required For Filing? A new year has rolled around and you are finally ready to sit down and take a look at those tax forms. If it is near the end of January or the beginning of February, you might have already received a W-2 form in the mail from your employer. This is a form that lists all of the wages you earned and taxes taken out of those wages throughout the year. HOLD ON TO THIS FORM!! It will become necessary to file your taxes going forward. The W-2 form has all of the information you will need to plug in when you file your 1040 or 1040EZ with the government. It is all neatly printed out in organized boxes so that you can follow instructions on the other forms as you fill it out. Remember, it is up to you as a taxpayer to file your taxes on time. This applies even if you are not expecting to receive a refund. You have until April 15th each year to file. Tax deductions are a beautiful thing. You can deduct money from the amount you owe (or the amount you should have paid in) by claiming certain recognized deductions from your bill. It is not something that is kept a secret even. In fact, the IRS itself features some of the deductions that you can take right on its own website. If any of these situations apply, it is easy to take some deductions from the taxes that you have to pay. Given this, you will want to make sure that you are gaining the maximum amount of value that you can out of these cuts to your tax bill. How nice would it be if the "EZ" in 1040EZ stood for "easy"? Unfortunately, that is not what those letters stand for. Rather, they exist only to refer to the part of the tax code that the particular form is relevant to. 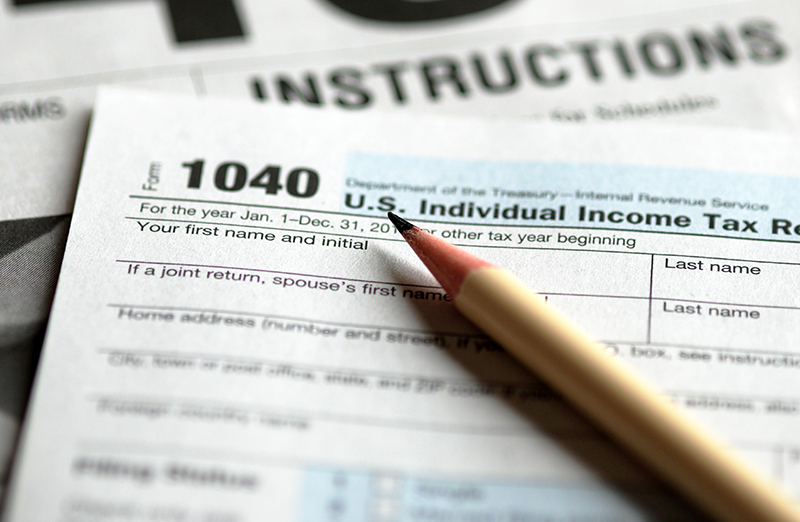 Therefore, everyone should take some time to learn the difference between a regular 1040 form and a 1040EZ form. The 1040EZ form is meant as a shortcut kind of form for most individual taxpayers. If their particular tax situation is not overly complicated, then this is the form that they probably should use. A 1040 form is a little more complicated. It is still designed for individual taxpayers, but it entails a little more work and is relevant to more complicated tax situations. Everyone has a tax situation, so there is no shame in filing out a more complicated form if you feel that it is going to do the trick for your personal situation. Tax preparation is a booming industry. As mentioned above, the tax forms put out by the government are extremely complicated to a lot of people. It is often easier for some people to go to a tax professional who can work with them to file their taxes quickly and easily. If they don't want to go to a professional to do it, they can at least use tax preparation software that cuts down on some of the workload as well. Some of the popular software products are: TurboTax, TaxAct, and H&R Block At Home. These are all great products that can walk you through the steps of getting your taxes paid. This method will still require some of your time and attention as you will need to fill in information from the forms sent to you onto the computer program. That being said, it is a lot quicker to do things this way than to do it will a pencil and paper. The old pencil and paper method would still require you to mail in your tax returns, and that adds a lot of time to the process. Tax professionals are available at outlets such as H&R Block, Jackson Hewitt, Liberty Tax, and many others. Some of those places are open all year long to help serve you with your tax questions no matter when you arrive with them. You can call or schedule an appointment with them online whenever it is best for you. If doing taxes is a drag, at least getting a refund is somewhat exciting. The thing is a lot of people do not know how to do that. It all starts back with their employer. They need to talk to that employer about how their tax filing status is currently set up. It is very likely that your employer had you fill out tax filing status paperwork when you were first hired. You might not remember doing it, but it can have a big impact on if you get a refund and for how much. Most individual employees will file either zero dependents or one dependent when asked that question. The difference between the two in terms of how much in taxes taken out is pretty big. Any person is allowed to claim one dependent. They can get even more dependents on their filing if they are married or have children. The more dependents that a person has, the less that will be taken out of their paychecks on a weekly basis. On the other hand, if they claim fewer dependents more will be taken out. However, over-payments into the IRS end up coming back to the taxpayer as a refund. It really just depends on if you would like to have that money on each weekly paycheck or if you are okay with the idea of receiving it back as a lump sum during tax season. Some like to receive that larger amount during tax season to fund a vacation or pay off some debts. Backed taxes are a very serious thing. If you have failed to file your taxes properly and not paid the amount that you were supposed to, expect that the IRS knows this and will be coming after you for that money. Don't be shocked if you open your mailbox one day and find a letter from the IRS stating the amount that they say you owe versus the amount that you actually paid. It is possible to challenge the amount that the IRS says that you owe. There are courts in which you can challenge the taxes that they say that you owe. That being said, if you feel that they are in fact correct in their estimations of what you owe, then it is time to go ahead and make a payment. A lot of people who receive notice of an IRS bill for backed taxes cannot afford to pay the amount that they owe in full. They likely would have paid it already if they could have done so. Given this, there are options to make a partial payment and get on a payment plan with the IRS. Form 9465 can be used by an individual taxpayer to take care of the partial payment setup that they have made with the IRS. These payments should be made faithfully in order to ensure that you remain on the good side of the IRS. There are a variety of reasons why one might file for an extension on their taxes. They might do so because they are serving in a combat zone or because they are going to be out of the country during the period of time when the taxes would be due, or they may have a complicated business partnership with a partner who fell sick just before tax time. There are also those who might not be able to pay their taxes when they are due. They may be able to pay them at a later date with a little more time. If that is the case, then they can ask the IRS for an extension in order to get those taxes paid. It is up to the discretion of the IRS as to allow for an extension on tax payments or not. However, the IRS usually will agree to the extension as long as the taxpayer has a good reason to ask for one. Given this, those who feel that they need to pay at a later time should take the time to file the extension using form 4868. It is certainly a much better option than not filing the taxes or just not paying them. Always seek professional tax advice if there is something that you do not understand. The tax code is very difficult to comprehend at times, and asking for help is a much better option than just guessing or than doing nothing at all and hoping for the best.